We are in the midst of festival season and the Vancouver summer is in full swing. What better way to enjoy the gorgeous weather and be around friends than heading to one of the many summer festivals in beautiful BC? These are five events you shouldn’t miss in July – be sure to check back for our August summer festival edition as well. Electronic music and arts festival in Merritt, BC, located in the heart of the picturesque Nicola Valley, offers a very intimate experience with only 3,000 tickets available ($280 before July 9, $300 at the gate). Musical acts include many international talents like Detroit Swindle, Ardalan and J:Kenzo, as well as Canadian artists like Basic Soul Unit and Vancouver-based Longwalkshortdock. With its stunning, natural scenery, Pemberton Valley is the perfect location for a three-day camping, summer music festival experience. 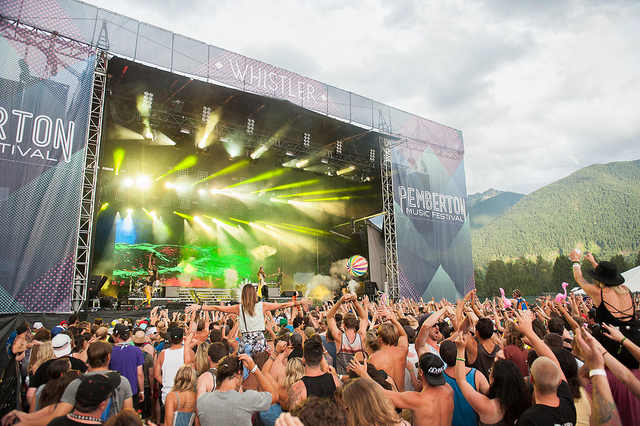 On multiple stages, Pemberton Music Festival offers an eclectic array of different music genres including rock, indie rock, hip-hop, electronic, heavy metal and comedy. Regular tickets ($299) are still available; camping costs $89 per person. Held each year at Jericho Beach Park and overlooking downtown Vancouver and the North Shore mountains, the Vancouver Folk Music Festival features folk music from around the globe. The lineup this year includes Richard Thompson, Angelique Kidjo, Duluth, Trampled by Turtles, Son Little, Phosphorescent, and many more. The adult weekend pass costs $145, students pay $100. Rock the Shores is the biggest rock festival on Vancouver Island. With large-scale video screens, it offers all rock-enthusiasts a premium festival experience. It also features a site-wide open liquor license, so no more gated beer gardens. This year’s rocker roster includes Grammy Awards winner Black Keyes and LA band Jane’s Addiction. General two-day tickets are $149.50. As Okanagan’s biggest annual summer beach festival, Center of Gravity not only features live music but also over 150 athletes competing in seven different sports (volleyball, basketball, wakeboarding, skateboarding, freestyle motocross and snowmobiling, and BMX). Music acts will perform on three stages and include Flo Rida, Diplo and Knife Party. A general three-day pass costs $189.95.